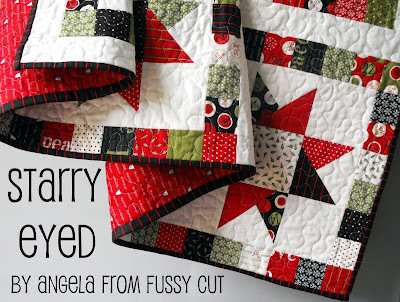 Pings & Needles: Blogiversary FQ Bundle giveaway … sponsored by ... ME! Blogiversary FQ Bundle giveaway … sponsored by ... ME! So, 1st Blogiversary eh? That means pay it forward time, in my book. A long long while ago (the back end of January!) I won an amazing giveaway over at Monica @HappyZombie’s blog for a mystery FQ bundle from Moda. I have to confess, I’m not a huge fan of Christmas fabric AT ALL, but my mind was totally changed when Angela @FussyCut’s posted this brilliant Starry Eyed quilt, on Moda Bakeshop back in July. I think this is the best use of Crimbo fabric I’ve ever seen, and I think this line would look brilliant. S-o-o-o-o-o … my Pay It Forward giveaway to you, my lovely readers, followers, stalkers and casual droppers by … is 16 FQs of Jovial, to do with whatever you wish. For another chance, in a separate comment, you could tell me the WORST present you have either given or received. That’s a whacking 5 chances chaps … Or just the one if you don’t like jumping through hoops. Please make sure that you have an email address somewhere in the trail - no-reply bloggers will lose out … It’s worth checking once in a while … for some reason my profile randomly just decides to revert to no-reply without me asking it to … To change this in blogger.com go to your Dashboard. Select Edit Profile. Check the box for "Show my Email Address." Save changes. Good Luck! ... mayMr Random Generator smile at you ... Giveaway ends Wednesday 31st August, midnight Pings time ..